If you use wordpress, like a lot of people do, sometimes you might have a high bounce rate inside your Google Analytics Account. I know did on a few of my sites and my client's sites. 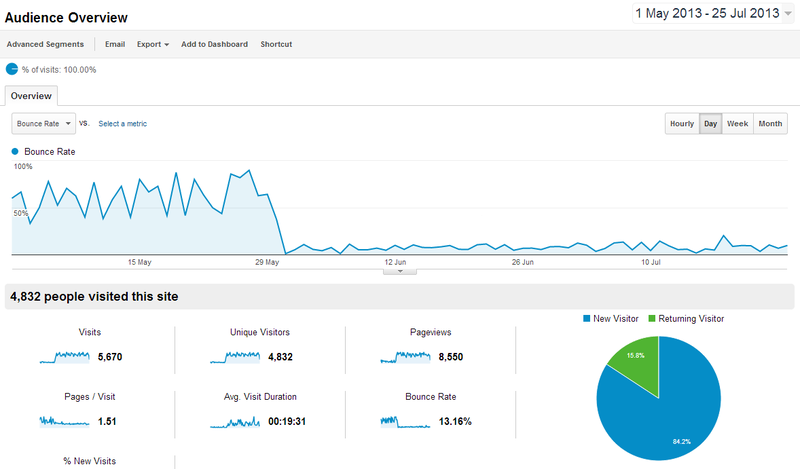 Google Analytics has a problem with wordpress. It is looking for an event, if a person lands on your page, and doesn't click anywhere else, that counts as a bounce, and you could have a high bounce rate. I have found 2 solutions. A wordpress plugin available here fixed the problem by adding something as a simple scroll of the mousewheel or simply staying on your page for 30 seconds as an event, and thus, the bounce is null and void. I have included a link below to a text file wherby you can add some text just above the tab in your footer.php file. This file is found in Appearance –> Editor. You then just select your footer.php file and paste in the code. Useful post Glen and I’m just about to install that wordpress plugin! Thanks for stopping by David, glad you got something out of the article. Thanks for sharing this Glen!